FROM ABOVE LINK YOU CAN DOWNLOAD CA FINAL INDIRECT TAX OR IDT AS ITS COMMONLY USED NOTES. NOTES ARE CONCISE SHORT AND DETAILED. NOTES ARE IN TUNE WITH ICAI STUDY MODULE. THESE ARE SUMMARY NOTES OF IDT IN JUST 20 PAGES. WHICH WILL BE OF IMMENSE HELP FOR STUDENTS A DAY BEFORE EXAM. 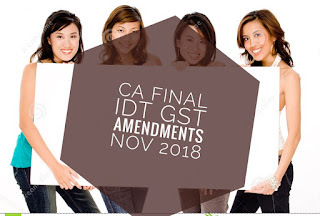 FOR ANY AMMENDMENTS YOU CAN CHECK CA FINAL IDT AMENDMENT. We are sharing list of sections of companies ACT 2013. Just copy and paste in notepad of your cellphone read it once daily and you will remember all the sections in no time. For ca final section 123 onwards. Quoting section in exams show your level of preparedness and and helps you in fetching good marks. Section 15- Alteration of memorandum or articles to be noted in every copy. Section 17- Copies of memorandum,articles, etc., to be given to members. Section 28- Offer of sale of shares by certain members of company. Section 34- Criminal liability for mis- statements in prospectus. Section 55- Issue and redemption of preference shares. Section 57- Punishment for personation ofshareholder. Section 74- Repayment of deposits, etc., accepted before commencement of this Act. Section 76- Acceptance of deposits from public by certain companies. Section 111- Circulation of members’ resolution. Section 113- Representation of corporations at meeting of companies and of creditors. Section 114- Ordinary and special resolutions. Section 134- Financial Statement, Boards report, etc. Section 145- Auditor to sign audit reports, etc. Section 170- Register of directors and key managerial personnel and their shareholding Section 171- Members right to inspect. Section 189- Register of contracts or arrangements in which directors are interested. Section 190- Contract of employment with managing or whole-time directors. Section 194- Prohibition on forward dealings in securities of company by director or. key managerial personnel. Section 200- Central Government or company to fix a limit with regard to remuneration. Section 224- Actions to be taken in pursuance of inspectors report. Section 371- Effect of registration under Part. Section 388- Provisions as to experts consent and allotment. Section 393- Companys failure to comply with provisions of this Chapter not to affect validity of contracts, etc. Section 410- Constitution of Appellate Tribunal. Section 411- Qualifications of Chairperson and Members of Appellate Tribunal. Section 442- Mediation and Conciliation penal. Section 463- Power of court to grant relief in certain cases. As per icai announcement Caro 2016 is applicable for November 2016 attempt fpr ipcc and final both. Here is the lecture for the same. This lecture is given by CA RAVI TAORI sir. This lecture also contains memory technique to learn all 16 clauses.